The study of knowledge traditionally studies of the problem 'to know'. This has been changed in more recent times, significantly by the work of Karl Popper who argued that knowledge was independent of the question of knowing, so the existence of knowledge did not depend on the existence of a knowing person. The position here follows Popper and can be summarised as follows. There is a Reality beyond our senses, which contribute to our knowledge, and we can know that knowledge. There are three relationships: first between knowledge and Reality, second between Reality and our knowing, and third between knowing and ourselves. The three relationships deal with three related but different issues. The first is how we come to know Reality, this is the problem of perception as it arises in this philosophy and is the topic of the first paper. Questions on our relationship with what we know are questions of psychology. For example, I have a friend who became involved with a woman who was recently separated. On several occasions we sat and discussed the very real problems occurring and those that could very likely occur. He knew the risks, he understood very well what was involved and he was most insightful about the likelihood of success. There was no problem with his knowledge (Note; the issues of relationships and the immediate future of someone's life after the breakdown of a long marriage are quite scientific in the sense that the issues and assessments of them can be quantified). Yet he chose to stay involved and fall in love. When it all fell apart a few months later he was devastated. But his friends, including myself were not very sympathetic. The anecdote is one of a person with knowledge of a situation who chooses not to heed the messages in that knowledge. To some extent and on occasions he chose not to think a certain way and stated such afterwards. He knew and did not want to know. There remains within the example the question of how we know at all. That is what happens when we have a thought. But this is not epistemology rather it is the mechanisms of epistemology, the workings of the brain. 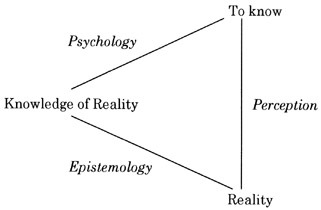 Strictly following Popper, epistemology is exploring the relationship between our knowledge of Reality and that Reality. It takes us into some very detailed, technical questions of the type already alluded to, questions such as those below. What exactly is the relationship between knowledge and Reality? In what way is there a Reality? How does Reality influence formation of our knowledge of it? If knowledge is an abstraction from Reality, then what is an abstraction? If knowledge of Reality exists independent of Reality, then in what manner does that knowledge exist (the ontological question)? If knowledge exists, then in line with all other objects it must have a structure. What is the structure of knowledge? Can we create a theory that describes the structure of knowledge itself?